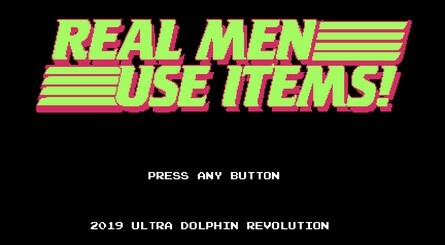 Retro-style Nindie developer Ultra Dolphin Revolution has revealed its latest project Real Men Use Items!, a Super Smash Bros.-like fight to the death planned exclusively for Nintendo systems. Featuring a complete 8-bit aesthetic, the game has you relying on your reflexes and using anything you can find to survive. Rather than smashing each other around the stage with kicks and punches, you'll need to make use of items to win this one; you can see this in action for yourself in the video above, with players slowly wiping out each other's lives using a wide variety of weapons. 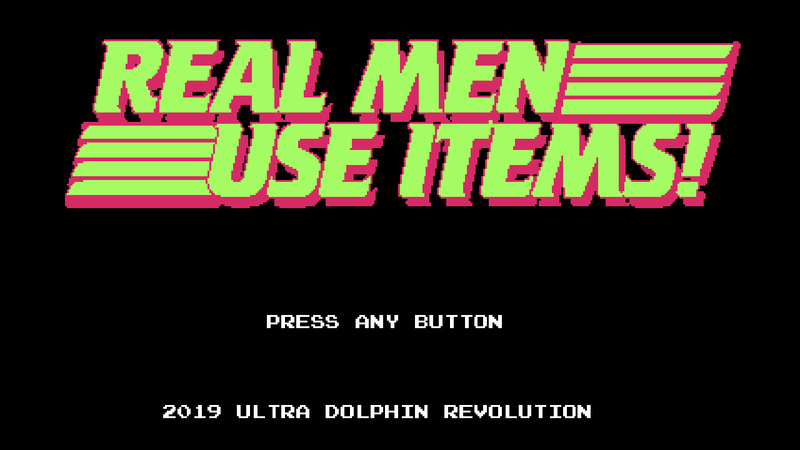 The game "pays tribute and parodies common power-ups and items in video game history", while also featuring items and stages from other Ultra Dolphin Revolution games like Shadow Archer and Spellcaster's Assistant. 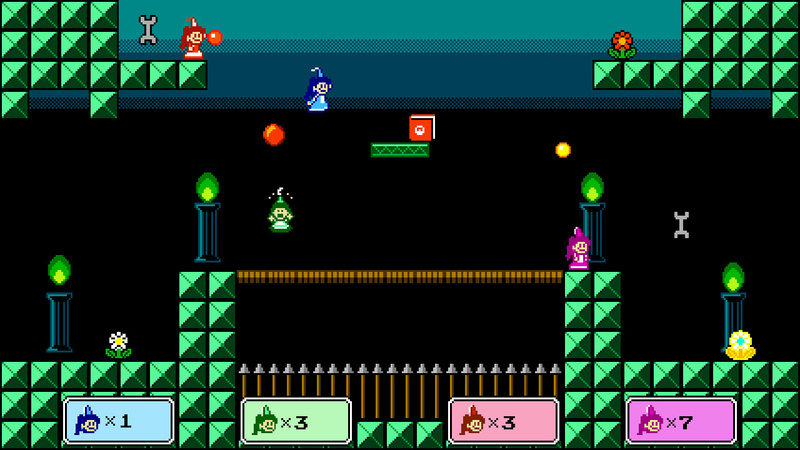 You can either play alone or grab up to three friends for chaotic, item-based matches; other modes such as adventure and arcade modes are also planned. No release date has been set for this one just yet - the developer says that it's still currently in early development - but we'll make sure to update you when we get more info. Until then, though, why not let us know what you think in the comments? Do you like the sound of an 8-bit Smash-style fight to the death? You what I always wanted? Not an 8-bit Smash Brothers! Nice title but the action is way too chaotic for me, Must be fun for 10mn. Looks like good fun with friends. I wouldn't really compare it to Smash Bros., though, considering each hit takes away a "stock", there doesn't seem to be any knockback growth or percentage system in place and of course it's not even a brawler. It is its own thing, which is fine. Another flash game lookalike made it to the switch? How is this possible? Honestly I think the concept has potential. 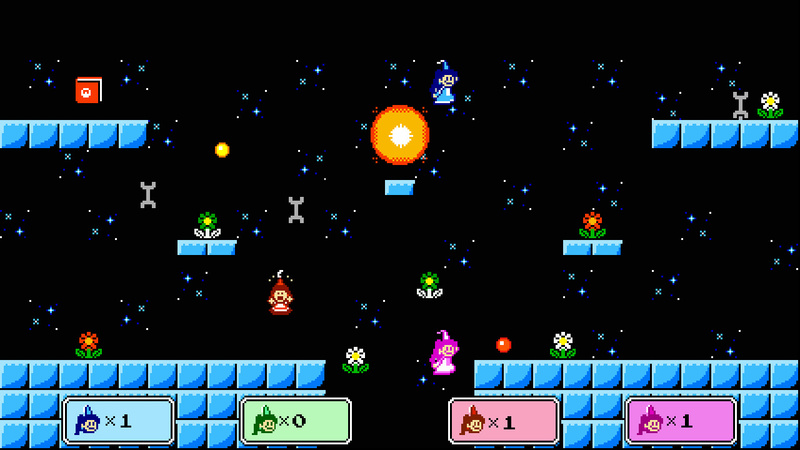 A smash clone in 8-bit style could be pretty interesting. But this doesn’t look that great to me. I guess we’ll see how it turns out. "A winner is blu" makes me smile but I'm honestly not sure if this is self aware humour or simply low production values. I think I'd rather wait for the multiplayer mode announced for Shovel Knight. This looks just plain awful. Something that would have been thrown onto Newgrounds or Kongregate 15 years ago, free of charge. They also need to find a better pixel artist or just drop the style. @personauser0893 I was thinking this yesterday on the "Download Lineup" article. That said, the title of this game is 100% true and accurate. Meh. I'll wait for Shovel Knight. Gameplay looks good enough for what it is, but whoever was responsible for that title really needs some kind of marketing consultant. If this looked more like Super Mario Bros 2, I would be interested (that game holds a special place in my heart). This just looks bad. Oooooooh my god . This looks sooo good. They nailed the style. The music and sound effects are spot on! One thing I must say... the game’s main mechanic seems better as a separate mode in a larger game but by no means does that make it less fun. Depending on final price, I’ll end up getting this. Uhhhh, I have to offer up a definitive no. 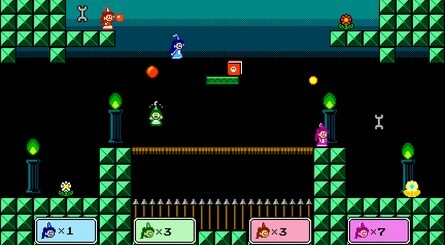 I still don't get why developers like to use an 8-bit retro style when a 16-bit style will always be superior. 8-bit style graphics are just ugly by modern standards, even for a retro look. For some reason they want it compared to Smash Bros, even though that's clearly not a favorable comparison, when the game play on display is much closer to something like Duck Game. Looks, & sounds like a very high quality Atari game. (No, I'm actually being both serious, & humorous.) More seriously, I will be watching this. Price, gameplay, and amount of content will determine whether I get this, or not. Also on thought: This is not necessarily a game, that by itself, would warrant paying for NSO(Online multiplayer).That's assuming NSO is required to play online multiplayer. @techdude haha yes, their name is really funny Ultra(codename for N64) Dolphin(codename for gamecube) Revolution(codename for Wii), made me chuckle. But no, it doesn't look like a quality game. So is it a dig at Smash Bros tournaments or a legit game title? Apparently both? I honestly couldn’t tell what was going on during the majority of that trailer. Way too much going on, and it just looked like a ton of chaotic movement with no point and very little contact between the actual characters. And I say that as a guy who's been playing crazy frenetic action games for almost the entirety of my 34 years of life. It doesn't look fun but we'll see. I'm waiting for games like Samurai Gunn 2 (I can't find the first one on the PS store anymore! ), Duck Game or even Roof Rage. These games are great couch multiplayer fun. Look like a petty game, I play a lot of retro but this looks like something that was forgotten on a 101 game cartridge back then. Doesn't look fun and seems pretty messy. "A WINNER IS BLUE" ? Lots of memes and retro-references here. The title written like Nintendo Power as well. For what it is, I think they're making the most of this! Oh good just what we need. Yet another 8bit indie game. As if we don't have a million of those pixelart games lying around. This...isn't a Smash-style game this is just Super Mario War. 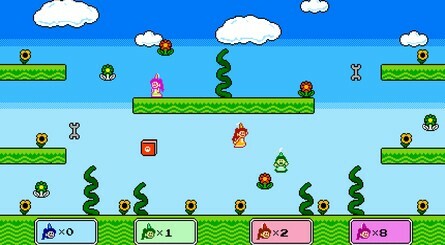 But then, I'm pretty sure I'm the only one who remembers that game so whatever I guess. @Heavyarms55 You can shut up and leave now. 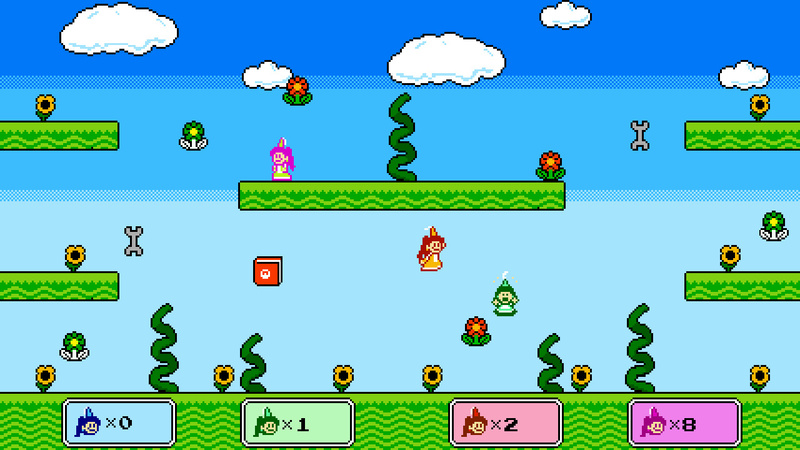 I played the prototype of this game two years ago on a Green Wii U. .....OR, we can, you know....play Smash. What platforms? It doesn’t say Switch. Using punctuation for a movie title or game title is cringeworthy. It makes it look lame or amateur. @BulbasaurusRex There isn't such a thing as "superior" if it's about Artstyle, it's an matter of taste... and each of this artstyles offers their own charme. Well it looks okay, i like the music but the gameplay didn't catch me that much. Though it also matters of the price, if i see it for 3 up to 5 bucks i might consider a buy. @TheLightningYu When the only differences between the art styles are the size and number of pixels and the number and quality of special graphical effects in use, then yes one is indeed objectively superior to the other. It's like putting a game with N64 level graphics in a GameCube game. It makes absolutely no sense to purposely limit the available quality of pixel art and 2D animation that you make. Yes, Shovel Knight looks good, BECAUSE it has a quality 16-bit graphical style. @BulbasaurusRex With that argument, why wish 16bit Games for Switch at all, because the same logic would follow Nintendo Switch in general, because compared to 16bit Games like Breath of the Wild etc would be the superior Artstyle (or if you go with 2D Graphics like New Super Mario Bros) - so no, your Argument is invalid, even if it's about the Size and Number of the Pixel, there isn't something like superior, because if you change from 8bit to 16 you will see it in the overall quality and feel more fake. Okay Shovel Knights does some tricks but overall it stays true to its 8bit roots. And that's why it still makes sense if you purposely limit it, so you stay more true to it's initial artdesign.